Jim tells us that the same very successful girls are eligible for the same age group next year again. We can look at their last two meets for an indication of just how good they all are. It was indeed a good day for the girls with victory in the Danner invitational where the top girls were Fiona Max (2), Teaghan Knox (6), Kelsey Gripehoven (11), 14 Isabel Max, Azza Swanson (15) and Jasper Fievet in 26th place. The points for the team were 38 and the second team was well back with 101 points. The equivalent Boys’ team was fifth out of 22 teams invited to compete with Zachey Weber fourth and best team runner on the day. The Girls Junior Varsity team over 5000m was well clear of the opposition taking the firt five places in the race. Top runners were Magdalene Williams, Ashley Boone, Liv Dowling, Ellie Skiersaa and Jorun Downing. They won with 15 points to nearest rivals 65. The Boys team was sixth out of 31 competing squads. Top man finished fourth (Will Lange). It was a big event with 19 races in all and the results of every race, including split times for all runners, were available almost immediately online. We could maybe take a lesson therefrom. The next meeting was the Oxford Classic ten days later and there were six races in all with Summit teams out in four of them. The Junior Varsity girls did as well as they could and won the race with Magdalene, Ashley and Jorun the first three across the finish line. Zoe Villano was 9th and Sophia Segesta 14th. Team points were 28 to second place Bend’s 49. The Junior Varsity 5000m race saw the girls win convincingly – with runners placed 1, 3, 5, 6, 7, 9 and a team total of 22 they won by 76 points from Capital. Top competitors in this one were (in order) Fiona Max, Teaghan Knox, Kelsey Gripekoven, Jasper Fievat, Isabel Max and Stella Skovborg. The Varsity 5000m, boys’ team won their race by 63 to 74. Their top runners were Zachry Weber in sixth, Sam Hatfield in seventh and Joseph Sortor in 14th. If the Boys were on an upswing, well the Junior Varsity 5000, showed that they had maybe swung up! 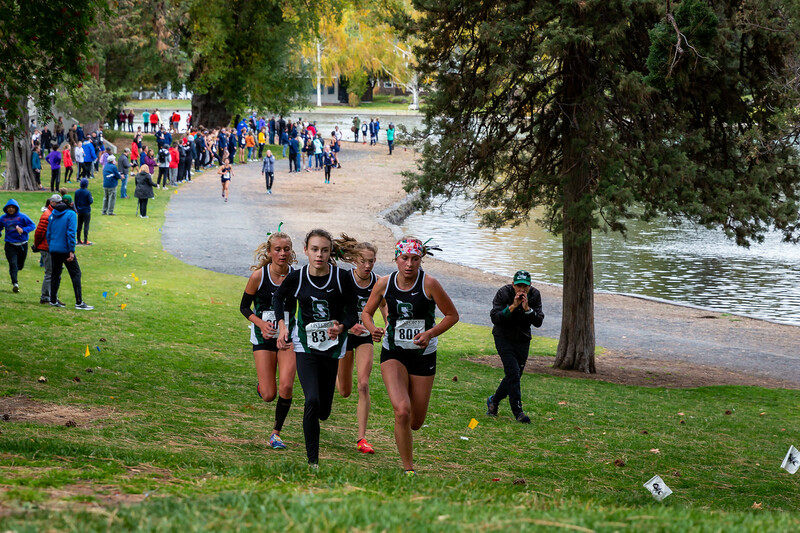 The team was first by 46 points from Bend with the top performers finishing 1, 2, 3, 4, 5 and 10. The heroes were, in finishing order, Mason Kissell, Nathaniel Henson, Jaden McCabe, Jesse Vanderborn, Jackson Keefer, and Connor Bellusci. Four races, four team victories, three individual first places and three races where the top two or three Summit athletes were battling each other for first place. 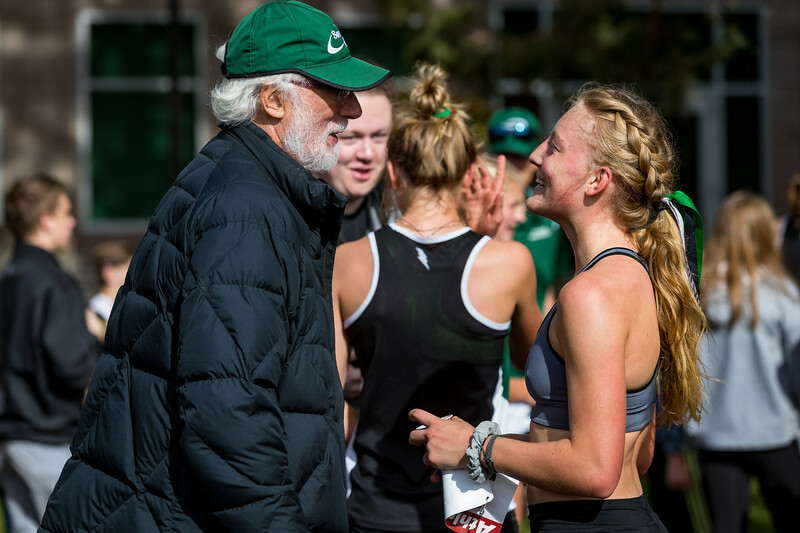 For instance in the girls JV Gold race winner Magdalene’s time was 20:14.72 against second placed Ashley’s 20:14.91 – less than two tenths of a second in it. Great stuff! Girls Varsity Gold, 5000m: Summit 27 points; St Mary’s 146, 21 Teams competing. 2nd Fiona Max 17:28.6; 3rd Teaghan Knox 17:47.3; 6th Kelsey Gripekoven 17:53.6; 7th Isabel Max 17:57.4; 9th Azza Swanson 18:08.7. The Junior Varsity Girls Gold Group: Summit 3rd (88 points) behind Lincoln (66) and Sunset 67. 17 teams finished. 6th Will Lange 17:08.7; 9th Jaden McCabe 17:11.0; 10th Jackson Keefer 17:11.2; 14th Parker Meredith 17:21,1; 15th Dhruva Sogal 17:21.3. There’s a lot of talent in Summit now, and it tales talent on the part of the coach to develop it. Jim and Carol deserve credit for how the teams are prepped for competition this season – but no one expected the next step in their progress. This came when MileSplit ranked them Number 1 in the USA. Look at this. Quite simply, Summit has run much better lately and has shown itself as the best team in the country. While the Golden Eagles have run well over the last month, they haven’t blown us away just yet and Summit is coming off a spectacular outing this weekend. 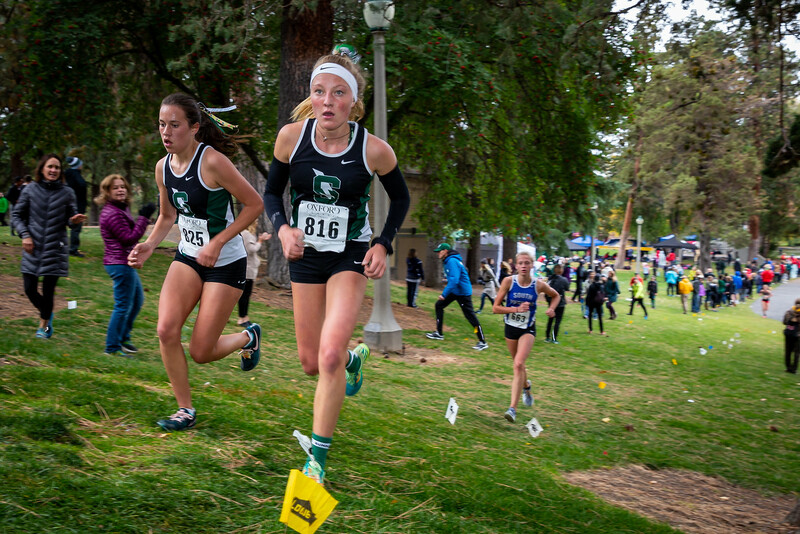 The argument for Mountain Vista: The Golden Eagles are coming off another solid win at the Continental Championships on Oct. 10 where they demolished the field with 27 points on an 18:55 average and 60 second spread. On Sept. 21, the team defeated ranked Cherokee Trail and (newly ranked) Battle Mountain in its biggest meet to date. At Liberty Bell, on Sept. 9, the Golden Eagles dispatched ranked Cherokee Trail, Niwot and a fast improving Peak to Peak Charter Team. How about the speed ratings? On Sept. 21, the squad produced: 138-124-121-112-110. On Sep. 9, the scores were: 136-130-129-129-115. Overall, Mountain Vista has beaten more ranked teams within their state. That is quite a ranking and, unlike many such lists, the rating body gives good sound reasons for their decision. Well done girls – and well done Jim and Carol McLatchie. 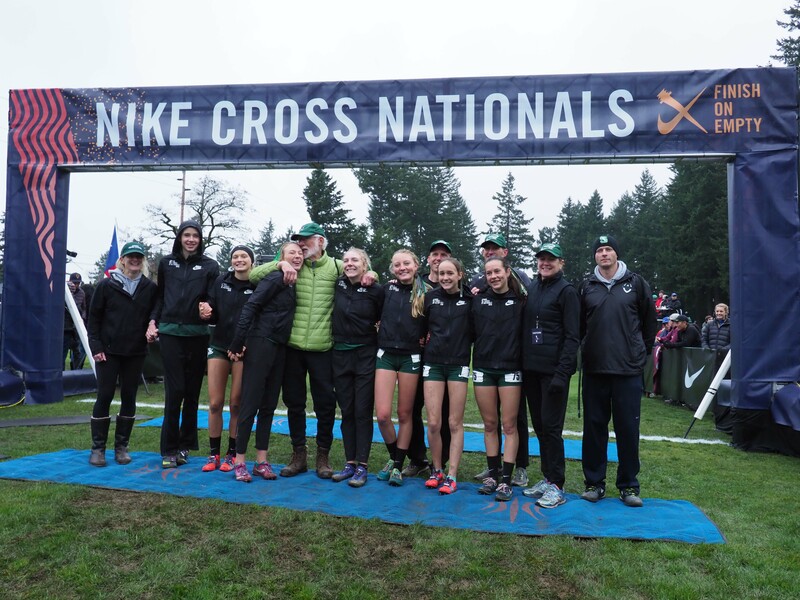 As Jim says, though, getting to the top is easier than staying there but then he has shown at State level that he knows a bit about that too: State cross-country titles won down the years since the school was opened in 2001 by the boys were in 2011, 2012, 2013, 2014, 2015 and 2016, and for the Girls in 2004, 2006, 2007, 2009, 2010, 2011, 2012, 2013, 2014, 2015 and 2016. And that’s not counting their contribution to the School’s many track & field titles either. Magdalene Williams; 2. Ashley Boone; 3. Jorun Dowling; 4. Ellie Skyersaa; 5. Jocelyn Parks; 7. Sophia Segesta; 8. Nicole Morgan; 11. Megan Lasala. And the boys: 1. Mason Kissell; 2. Jackson Keefer; 3. Jesse Vandenborn; 4. Jack Strang; 5. Parker Meredith; 7. Tobias Holme; 10 Milo Mora; 11. Evan Grover. Women: 1. Fiona Max; 2. Teaghan Knox; 3. Kelsey Gripekoven; 6. Isabel Max; 8. Jasper Fievert; 9. Azza Swanson; 10. Stella Skovborg. Men: 1. Zachry Weber; 3. Sam Hatfield; 4. Joseph Sortor; 9. Nathaniel Henson; 16. Sam Timms; 19. Jaden McCabe. On 3rd November, the Varsity teams were at the State Championships and Jim was there to see them perform. It was a higher standard of race but the girls did the business again. In a field of 155 runners and 21 teams they were first by 29 points – 39 points to Jesuits 68 with the third team, Lincoln, well back on 147. It was their eleventh victory in a row and a tribute to the girls and their coaches. Ten in a row places a lot of pressure on the runners as they go to the starting line but they were equal to the pressure – just note that Fiona Max won the race by 14 seconds in a time only two seconds outside the course record. Jim’s advice to her was to make a move on the hill on the last lap and keep it rolling from there: it worked, and she won in some style. As did the team. The boys ran well to finish fifth team of the 21 that were competing. Tom runner was Zachry Weber who finished twelfth in 15:54 which by any standard is a good time for his age group over 5000m of country, and only 17 seconds behind the winner. Sam Hatfield was eighteenth only 15 seconds down. 48th was Joseph Sortor, Robert Gorman was 57th and Mason Kissell 93rd..
Fiona Max 17:29; 5. Teaghan Knox 18:01; 8. Isabel Max 18:13; 11. Kelsey Gripekoven 18:16; 14. Azza Swanson 18:27 This was really excellent packing by the team – they had five in before Jesuit had three and before Lincoln had three, and eight Summit runners were in front of Jesuit’s fifth scoring athlete. 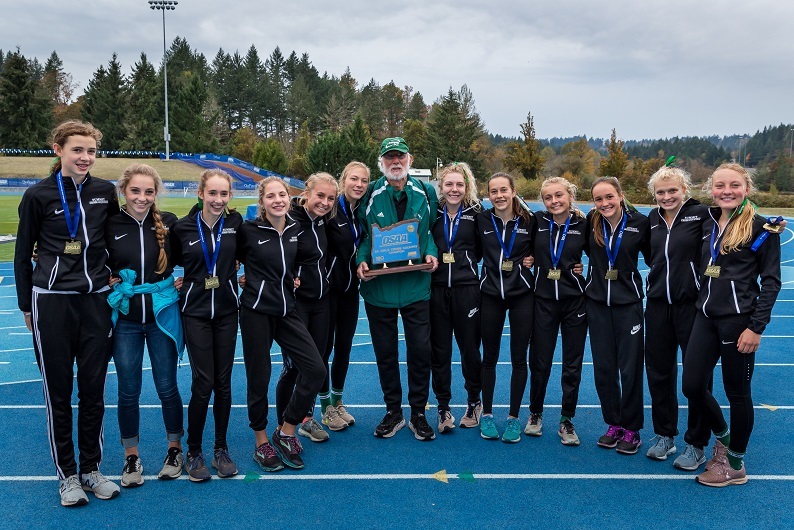 EUGENE — Sure, Summit is proud of its run of 10 consecutive 5A girls cross country titles. But what the Storm accomplished Saturday at the OSAA/OnPoint Community Credit Union 6A championships at Lane Community College was on another level, entirely. “We’ve never shied from competition. We’ve always felt that we belonged in 6A,” Summit co-coach Jim McLatchie said. Summit junior Fiona Max led the way by winning the individual title in 17 minutes, 29 seconds. 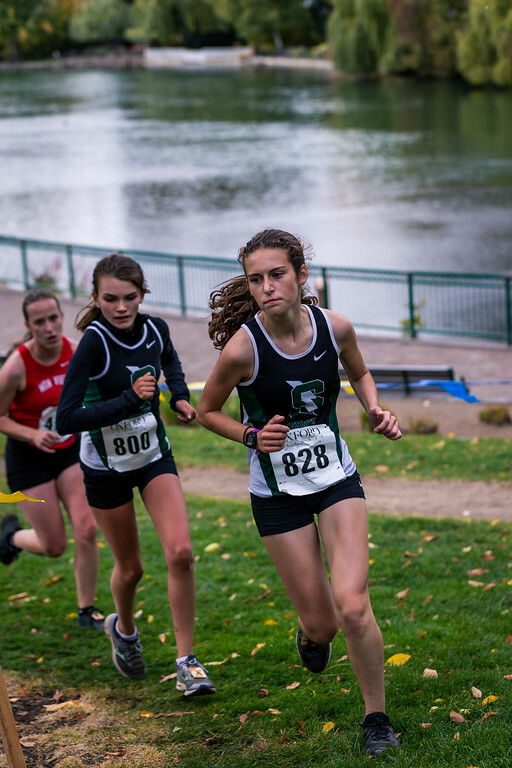 The Storm’s other scorers were freshman Teaghan Knox (fifth) and juniors Isabell Max (eighth), Kelsey Gripekoven (11th) and Azza Borovicka Swanson (14th). Gripekoven is a transfer from Jesuit, where she helped the Crusaders win the title last year. 11th F Max 17:29.0; 42nd T Knox 18:00.7; 67th K Gripkoven 18:18.2; 77th I Max 18:29.2; 96th. A Swanson 18:42.7; 134th S Skovberg 19:10.5. The team was first of the 22 teams that qualified for the Nationals with a 1.13 minute spread and an average time of 18:11. Terrific result to go with all the other top displays of running put on by the team this year. The icing on this wonderful cake was provided when Jim and Carol were jointly named as Coach of the Year. The results alone make the award more than just appropriate but when you add in the problems that his health problems from October inevitably imposed, it was a well deserved honour.